CONSIDERABLE: Significant accumulations of heavy snow and drifting from sustained southwest winds have caused dangerous conditions, and triggered avalanches are likely at upper and mid elevations. Slab avalanches consisting of wind drifted snow and large cornice falls are most likely on upper elevation north, northeast, and east facing slopes. Slopes with buried persistent weak layers were overloaded by heavy drifted snow, increasing the chances of triggering a dangerous deep hard slab avalanche. Stay off and out from under ridge-top cornices and steep slopes with recent deposits of wind drifted snow. Take time this winter to make avalanche education a priority for you and your backcountry partners. Join the UAC's Backcountry 101, Introduction to Avalanches Class this weekend at Powder Mountain. Get more details on the UAC Education page. The Tony Grove Snotel at 8400' reports about 3 inches of cold snow in the last 24 hours, with .2" SWE. The station recorded a couple feet of heavy snow containing 3.7" of SWE in the past 5 days. It's 3º F this morning and there's 75" of total snow containing 98% of average SWE for the date. It's -4º F, at the 9700' CSI Logan Peak weather station. West-northwest winds are currently averaging around 20 mph. A cold Pacific storm system will exit the region this morning. High pressure aloft will follow for the latter half of the week. Another potent storm is expected late this weekend into early next week. Today in the Logan Zone, it'll be partly sunny in the mountains, with temperatures at 8500' expected to be around 15º F, and 15 to 20 mph west-northwest winds decreasing in the afternoon. Tonight, temperatures will fall to around -4º F and 10 mph southwest wind will cause wind chills around 19º F below zero. It'll be partly sunny tomorrow with high temperatures near 19º F and 10 to 15 mph south-southwest winds. Large, deep hard slab avalanches like this natural on the Wasatch Crest ridge above Park City are possible in some areas where heavy drifted new snow overloaded buried persistent weak layers. Dangerous conditions exist on drifted upper and mid elevation slopes. Human triggered avalanches, 2 to 3 feet deep and large cornice falls are likely today and natural avalanches are possible. Winds diminished and veered out of the northwest overnight, but after 3 days with strong and sustained south and southwest winds, the danger of avalanches caused by wind drifted snow is significant. Cornices are likely to break much further back than expected and could be quite large. Avalanches and cornice falls are most likely at upper elevations on slopes facing north, northeast, and east. 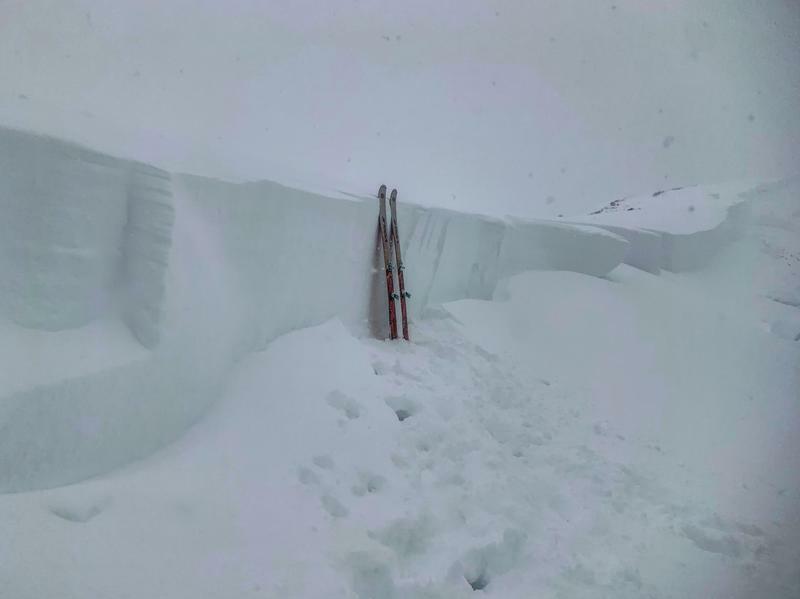 In some areas the new snow may not have bonded well to last week's weak surface snow in some areas, and 2-foot-deep soft slab avalanches consisting of heavy new snow are possible even in sheltered terrain. Frost or feathery surface hoar and thick and thinner layers of small-grained near surface facets plagued the snow surface on many slopes before the storm. These are notorious persistent weak layers, and in some areas were buried intact, so the danger of avalanches failing on one will linger for a while. The storm added a good deal of weight to slopes with poor snow structure and has increased the danger of avalanches failing on a deeper persistent weak layer. Buried layers of sugary faceted snow have likely been reactivated. Dangerous, 3 to 5-foot-deep hard slab avalanches are possible for people to trigger, especially on steep, recently drifted slopes with poor snow structure. I will update this forecast Friday morning.